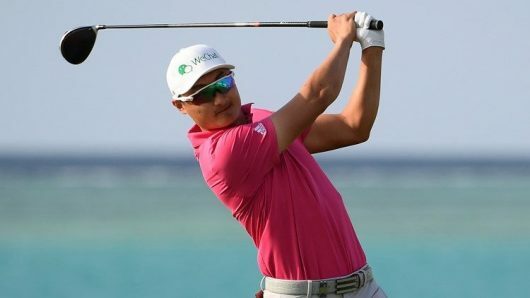 China’s Li Haotong (pictured) was in full flight as he slam-dunked four eagles in the third round of the inaugural Saudi International being played in the oil-rich nation of Saudi Arabia. Li’s blazing performance earned him a share of the lead with the world’s number three ranked golfer, Dustin Johnson on 16-under, five clear of the chasing pack. The 23-year-old began his third round in perfect style when he holed out from the rough at the first for a stunning eagle-two. He did so again on the 10th and 17th holes before finishing off with a total of four eagles. With this spectacular performance, Li became the first player to card four eagles in a single round on the European Tour since 2007. In response to his four eagles, Li said: “I think I was very, very lucky today …… the last couple of shots were really solid.. I just want to play my best on Sunday and enjoy myself in the final round.” Li will be paired with Johnson in the final round. Meanwhile Spaniard Sergio Garcia was disqualified for damaging the greens in frustration. “I respect the decision of my disqualification. In frustration, I damaged a couple of greens, for which I apologise for, and I have informed my fellow players it will never happen again, “ Garcia said.